Following on from two enormously successful outings, one to watch the Moomins and the second to watch The Emperor’s New Clothes, J and I were back at The Waterside Arts Centre last weekend. 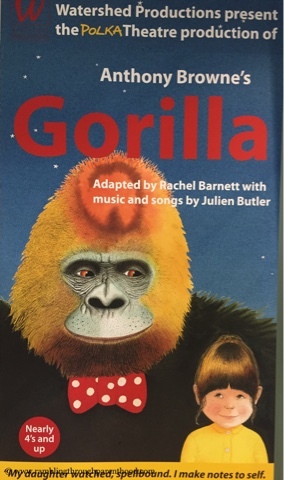 This time, it was to watch a production of Gorilla by Watershed Productions. The story is fairly straightforward. Hannah is a little girl who adores gorillas. She knows all about them, and spends hours drawing pictures of these marvellous creatures. Hannah’s Daddy is a very busy man and struggles to find time to play with his daughter. Hannah wishes her father were more like a gorilla; they always have time to play with their offspring. Hannah wants a real, live gorilla for her birthday and is disappointed to get a toy instead. Birthday magic comes into play and Hannah has a wonderful adventure with a real gorilla. Or is it all a very vivid dream? Come morning, Daddy is a changed man. He now has time to spend with Hannah. The story may be simple enough, but the message I received was very powerful. It reminded me to make time for my son. For he will be little only for so long. And if I blink, I will have missed his childhood, missed these moments of utter preciousness. And he will be all grown up, no longer wishing to play with me. No longer asking to eat cake for breakfast. Or do all those crazy and wonderful things that little children long to do with their parents but can’t. Because we mums and dads are too busy, too caught up in the mundane, to realise the worth of these fleeting moments. Life is just a little bit better with a cherry on top, and it took Gorilla to remind me. The Waterside Arts Centre has a fabulous line up of shows for this summer. From theatre to music to film screenings and art exhibitions, they have it all covered. Do pop in for a visit if you find yourself in or around Greater Manchester. Disclosure: We were given complimentary tickets to watch this production of Gorilla in exchange for this review. All opinions are my own. The story is beautiful. It's funny how something like this makes you think and maybe even change a thing or two in your own life. I agree. I do think I have been just a little bit more aware of time well spent with my son since watching the show. I love it too. Always prefer theatre to cinema if I have a choice. What was so good about it is although apparently a children's theatre show, it had this powerful message for parents. Sounds like a lovely story. I love going to the theatre & put that down to being inspired as a child. You are welcome. It is so easy to get caught up in the mundane and overlook that what really matters. I agree, Emily. I do love visiting our local theatre and enjoy what they do to support smaller companies. Sounds like a good book! I like to concept behind it and the message you got out of it is lovely. Oops, not a book, I'm afraid, Lorraine :-D It was a theatre production, though now you mention it, I wonder if it is based on a book. Not sure it is based on a book, Tracey. But now I am going to find out.